Saturday the 8th of March witnessed the running of the San Felipe Stakes which was won very impressively by a California Bred appropriately named California Chrome. Before we take up California Chrome and why a rather obscure California stallion such as Lucky Pulpit sires a Kentucky Derby contender I’d like to present to you my thoughts leading up to the San Felipe Stakes. March 8th was the running of the San Felipe Stakes. Like most racing fans I’m puzzled by the performance of Midnight Hawk in the Robert B. Lewis Stakes a month ago. In my opinion this shows the best reason not to bet on horses. After much consideration I came to the conclusion that Midnight Hawk was not so much out to win the Robert B. Lewis Stakes as he was in it to be schooled for bigger things ahead. Why did I come to this conclusion? For one thing the work pattern leading up to the race was unusual. 11 days prior to the race he worked 5 furlongs in a leisurely 103.20. Why would one find this work unusual? For one thing Midnight Hawk is a fast work horse. Prior to the Sham Stakes he worked 5 furlongs in 58 and change. It would seem to me that the slow work in preparation for the Robert B. Lewis was to take the edge off a horse that was going to use the Lewis for schooling to teach him to rate. Remember, one does not go to stud with a $100,000 stud fee for winning races like the Robert B. Lewis, but one does if they win races like the Kentucky Derby or the Triple Crown. Midnight hawk is a headstrong horse which needs to learn to rate. He has another Bad habit which is bearing in and trying to get to the rail. If you watch the running of the Robert B. Lewis closely you will see that Mike Smith does not get into Midnight hawk at the head of the stretch as does Gary Stevens does on Candy Boy. He hand rides him as if the only way he is going to win is if he is much the best. Smith only hits Midnight Hawk once about 70 yards for the wire. Midnight Hawk did not gallop out strongly either but did it like a tired horse. Now, for the San Felipe these are his works; Feb. 16th 4f in 47.80, Feb 21st 5f in 59.60, Feb 26th 5f in 58.80 and today 4 days before the San Felipe 4f in 49.40. The works say he is ready for a top effort but what is undecided is did he learn to rate. The key factor to watch where Midnight Hawk is concerned is does Mike Smith stay on him as his Derby mount. He will know better than anyone if Midnight Hawk is leaning his lessons. One last thing to keep in mind is what I mentioned in the original essay on Midnight Hawk, this concerns his connections. Remember, when the same people were preparing Midnight Hawk’s grandsire Real Quiet for the Kentucky Derby he did not win a single prep race leading up to the Derby. Real Quiet’s preparation for the Derby consisted of an 8th place finish in the Golden Gate Derby on January 18th beaten 22 lengths. Followed by a 2nd place finish, beaten a head in the San Felipe Stakes on March 14th. On April 4th he ran 2nd by 2 ¼ lengths to Indian Charlie in the Santa Anita Derby. 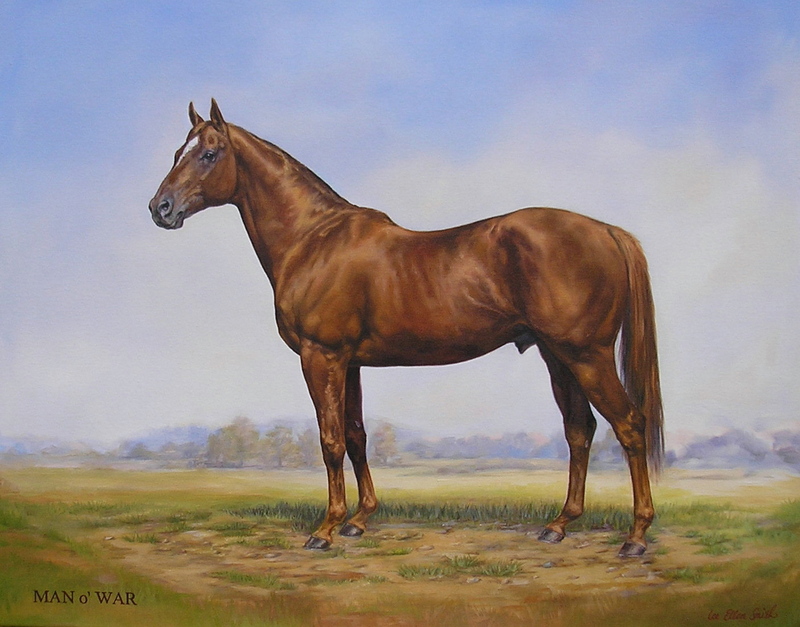 From there on it was a different story, 1st in the Kentucky Derby by a ½ length, 1st in the Preakness Stakes by 2 ¼ lengths and 2nd in the Belmont Stakes by a nose. Where Midnight Hawk is concerned watch and see if he can be rated. Since I wrote the above Midnight hawk has run three more races finishing 2nd in the San Felipe to California Chrome, 2nd in the Sunland Park Derby to his stablemate, Chitu, and then this past Saturday another 2nd in the Illinois Derby to Dynamic Impact a horse which prior to the Illinois Derby had only won a maiden race. So what can be said about Midnight Hawk at this point? First, he is sound. He has made 5 starts all in graded stakes since the 1st of the year. Second he is fast. He was up near the lead in the San Felipe after a mile in 1:33 4/5. So what is his problem. I would say immaturity of the mental sort. It might be a good idea to give him a vacation and bring him back later in the year. This brings us to California Chrome and his brilliant victory in the San Felipe during which Midnight Hawk after getting off to a slow start rated fairly well a neck behind the leader. Although Midnight Hawk ran well California Chrome ran even better. Keep in mind that if California Chrome had not been in the race Midnight Hawk would have won it by 6 ¼ lengths. In the race California Chrome led all the way with fractions of 23.09, 45.55, 109.45, 133.94, 140.59. Granted the track was lightening fast where Game on Dude raced through a mile in 132.57 close to the world’s record on dirt for the mile, and 158.17 close to the 1 ¼ mile world mark. Still, pushed by Midnight Hawk, California Chrome left that one in the dust as they turned for home. Midnight Hawk did not break well bumping with another horse before rushing up into a contending position going four wide into the clubhouse turn. Nevertheless, there was no way Midnight Hawk was going to beat California Chrome on this day as the winner pulled away with surprising ease down the stretch. Up until this race I had paid little attention to California Chrome a relatively unheralded California Bred. When I looked at his dam I was not too very surprised by what I found. 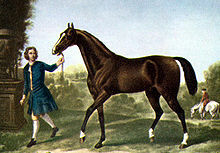 In fact, the pedigree of the dam of California Chrome and the dam of his great grandsire Seattle Slew are very similar. If you recall Seattle Slew sold for only $17,500 primarily because his sire Bold Reasoning was not that well thought of and Seattle Slew was from his first crop. In the case of Seattle Slew and California Chrome their dams may provide the answer as to where the racing ability originated. 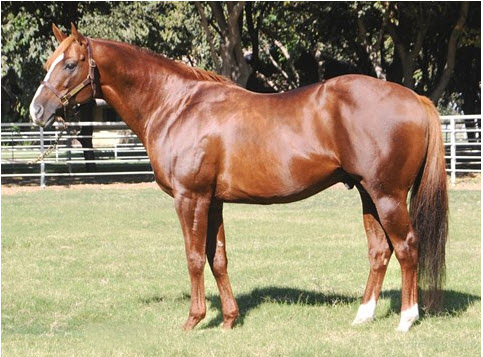 First look at the pedigree of Love the Chase the dam of California Chrome. 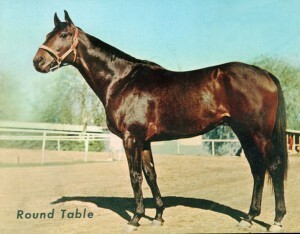 She is inbred to Numbered Account the champion two-year-old filly of 1971. 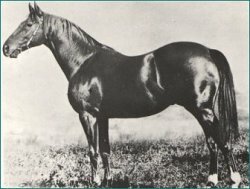 It is important to note that Numbered Account is inbred to La Troienne through both her sire Buckpasser and her dam Intriguing. Since Numbered Account appears twice in Love the Chase’s pedigree it gives her daughter 4 crosses of La Troienne. In Love the Chase’s pedigree her sire Not for Love traces to Numbered Account as does Polish Navy the sire of her dam. 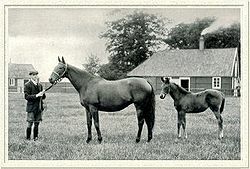 In Seattle Slew’s dam My Charmer, her sire Poker traces to Baby League (a daughter of La Troienne) and her dam’s sire, Jet Action also traces to Baby League and thence to La Troienne. One other additional note on My Charmer, her dam Fair Charmer has the pedigree pattern that often leads to a concentration of classic speed. Her sire Jet Action traces down his female line to Myrtlewood’s dam Frizeur and so does her dam. Here is one last thought on the upcoming classics. My favorite horse when I was a teenager was Round Table. By today’s standards he was a mighty horse, maybe even a super horse. He started 66 times and won 43 races. He carried 130 pounds or more 25 times and won 17 of those races. In one 20 week period he started 11 times. He started on average every two weeks during that period and won all 11 races. These races included 3 at 1 ¼ miles including the Hollywood Gold Cup and Hawthorne Gold Cup against older horses and the American Derby against his own age group. 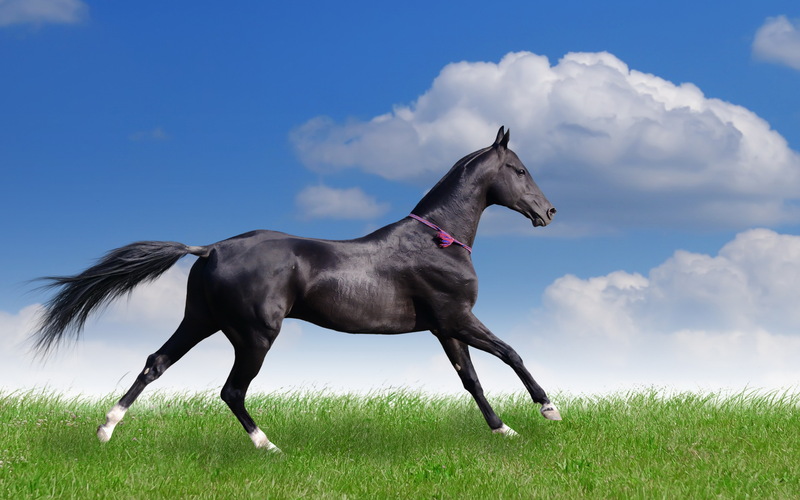 Where is such a horse today? The reason we don’t have them anymore is drugs. The American racehorse used to be the world’s strongest and soundest and now we are beginning to push back the preps races for the classic’s because Lasix’s is a debilitating drug that takes so much weight off a horse that it takes weeks for the horse to recover. George Strawbridge Jr. the owner of top European Sprinter Moonlight Cloud said in the Thoroughbred Daily News Magazine that the reason American horses can no longer bounce back in a week or two is because of Lasix. “The recovery time would not allow it,” he says. 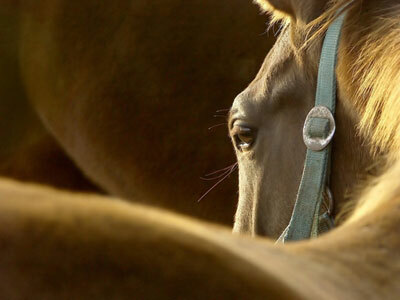 “Whenever you dehydrate a horse to that extent it is not possible. Look at human athletes, they don’t dehydrate themselves before they race. Considering that very few horses that use Lasix are actually bleeders and that almost 95% of starters are running on it says a lot. How can you handicap this when you have no idea how fast each individual horse takes to recover. This could explain Midnight Hawk’s slow regression. If he runs on Lasix each time, and he’s had 5 preps, how much does this take out of him? The truth is we’ll never know. I only hope that when the Jockey Club meets in August they will find a solution to this problem.